Pivotal’s logo was inspired by one of our daughter Kate Smail’s designer necklaces. Multi-coloured and multi-layered it shouts energy, uniqueness and flair. Expert design skills coupled with specialist techniques and creativity transformed individual buttons – a mix of everyday and extraordinary – into a work of wearable art much greater than the sum of its parts. What a beautiful metaphor for the role of a facilitator! action – a web icon; the lift button; the ‘reset’ button. We also desired an image with a strong sense of forward momentum to reflect our intense focus on helping clients get crystal clear about their requirements then working with them to achieve desired results. Sheryl Smail shares stakeholder engagement details for Gisborne District Council’s Gold Facilitation Impact Award project. Right from the outset the IAF Oceania 2016 Conference was fantastic! The buzz started with reconnecting with my facilitator colleagues from around the globe then continued when I attended a pre-conference workshop ‘Understanding Group Functioning using Aesthetic/Intuitive Senses’ with Dr George Wills, a psychologist and Rhonda Tranks, CPF. The day flew by as we explored our work with groups using a very different frame of reference than I would normally. At the opening plenary, not only did IAF Regional Director Nick Housego highlight the two 2015 Facilitation Impact Awards achieved in Oceania, he unexpectedly also gave Marg Leser and Andrew Huffer, facilitators for the Perth initiative and me the opportunity to share details with the conference – that’s me above talking off the cuff to Conference. It was wonderful to get this air time for the Gisborne District Council’s project and it generated a lot of interest in the stakeholder engagement processes I’d used. My conference workshop was scheduled for day 1. It was designed for beginning facilitators, however, most people who joined me for the session were very experienced. This meant a few changes on the fly with how I ran the workshop. So I was gratified to receive feedback comments such as “Invaluable workshop with Sheryl Smail. Great to watch her facilitate. Learnt heaps.” The bonus for me was that I got heaps out of it too! I was very pleased with the choices I made for the concurrent workshops I attended. The sessions I attended were diverse, lots of fun and I learnt new things from each of them. The ‘Facilitation Lab’ that Nick Housego, CPF and Pauline Bergin, CPF facilitated grabbed our attention from the start – commencing with parts of a ‘dead’ facilitator strewn all around the room! The session built on real facilitation case studies that each of them had experienced. Hong Li Lim, CPF facilitated a thought provoking and engaging session ‘Do you know your inner strengths and driving motivation?’. In addition to the key learnings of her session I picked up lots of tips re simple effective activities. 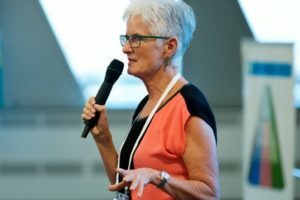 Then Hedy Bryant, CPF shared learnings from her thesis in ‘Shapeshifting: The body in professional practice when facilitating organisational change’. A role play I did in this session with the inimitable Martin as a reptile proved to be amazingly insightful! And in my last concurrent workshop ‘What Lies Beneath’ with Jennifer Lumsden I gained lots of practical tips for effectively using story telling! Virtual technology enabled us to have a thought provoking plenary session with Roger Schwarz ‘Helping our Clients get Better Results: Challenging our assumptions about facilitation’. And another plenary session ‘What Time is it Where You Are?’ facilitated by Martin Farrell enabled us to reflect on what we had got from conference and translate this into meaningful personal actions and commitments. All in all a very professionally and personally satisfying few days. The only downside being that I didn’t get any opportunity to explore Melbourne again! One of the many roles facilitators are called on to play is to be an independent party to assist groups to make consensus decisions. 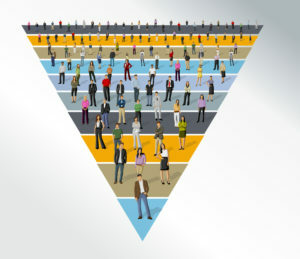 What is considered group consensus depends on many variables including the culture and community, the nature of the task or decision, and the commitment required from participants to implement any decision outcomes. In addition, the effectiveness of different consensus building methodologies will be affected by variables such as the time available, the size of the group, and the literacy and other skill levels of participants. It is important to note that consensus is not unanimity – although some groups may require unanimity for consensus as part of their culture. Although there may be one or two who don’t like the final decision, this type of consensus ensures that everyone is heard and heard well. Do join me and lots of facilitator colleagues! Conference runs from 25 – 27 May 2016 with Pre-Conference Workshops on 24 & 25 May. Next month I’ll be off to Melbourne for the May 2016 IAF Oceania Conference pushing the boundaries of facilitation. I’m going to be facilitating a workshop designed to strengthen less experienced facilitators’ tool kits. It’ll be a lot of fun!! We’ll explore and practice together common process tools for facilitating meetings more easily and productively, a methodology for achieving consensus and a fabulous multi-purpose facilitation framework. This is a fantastic opportunity to share your insights and challenges and learn from others. Look forward to meeting up with lots of facilitator colleagues from around the globe there! 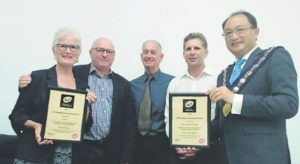 It was a very proud moment for pivotal when the International Association of Facilitators awarded the Gisborne District Council and Sheryl Smail a Gold Facilitation Impact Award (FIA) for the development of the Wainui Beach Erosion Management Strategy. Oceania Regional Director Nick Housego presented the award at a Gisborne District Council meeting. The IAF’s Facilitation Impact Awards are the most prestigious international awards in the world for demonstrations of facilitation excellence. One of only 9 Gold Awards internationally. I have global Professional Development accountabilities. This has resulted in me having to transition from being a participant in multi-participant online meetings to facilitating them. My sense is that I’m not on my own with this steep learning curve. If you’re interested, I plan to share some of my learnings as I go along. Today I share some of my learnings about simply getting ready for the event. And believe me, even with wonderful support from experienced colleagues, I’ve still learnt the hard way!